Wayne Fox has been the conductor of the Perseverance Band since 1979. He is a 1973 graduate of Lebanon Valley College with a B.S. degree in Music Education. He also holds a Master’s degree in Jazz Pedagogy from the University of Miami (Coral Gables, FL). He is retired from the Cornwall-Lebanon School District where he taught for elementary band 37 years. He also served as the Music Department Chair for 26 years. He is active as a private music instructor and freelance musician in the Central Pennsylvania area performing with, among others, the Hershey Theater Orchestra, the Buzz Jones Big Band, the Dave Stahl Big Band, the Blue Moon Big Band, and the Bill Dayton Orchestra. A native of Womelsdorf, PA, Peg Schaeffer began her musical career at the age of six when she started taking piano lessons. Two years later accordion lessons were added. At the age of ten, after begging her parents to let her learn a band instrument, drum lessons were decided upon simply because there was a snare drum tucked away in the attic. Pipe organ lessons were added during her high school years. After graduating from Conrad Weiser High School, she attended Lebanon Valley College for two years majoring in pipe organ performance and English literature. She ultimately received a degree in business administration from Berks Technical Institute. She served as Organist and Choir Director at Zion Lutheran Church in Womelsdorf for over 30 years. In addition to her 17 years playing percussion with the Perse Band, she also performs with the Ringgold Band of Reading and the Keystone Band of Rehrersburg. She has also been a member of the Ephrata Community Band, the Lebanon Community Concert Band, the Washington Band of Annville, and while living in Florida with her husband (and Perseverance Band groupie), Leroy, she was a member of the North Port Concert Band, the North Port Orchestra, and the Charlotte County Band. Peg and Leroy live in South Lebanon Township with their Beagle named Becken (German for cymbals). Lisa Meyer has enjoyed being a member of the Perseverance Band since 1976. She was graduated from Lebanon High School in 1972 where she participated in all musical activities. She played the flute in the band and accompanied the chorus and the concert choir. Lisa was graduated from Lebanon Valley College in 1976 with a B.S. degree in Music Education. While in college, she was a member of the Sigma Alpha Iota music fraternity. The Delta Alpha chapter was recognized nationally for donating the most notated music to the Library of Congress that enable partially sighted musicians to read and enjoy making music. Lisa retired from Lower Dauphin School District after teaching music there for 37 years. She taught band, strings, chorus, and general music classes. During her teaching career Lisa also served as the General Chairman of the Dauphin County Choral Association for 20 years. She has been active as an organist and choir director for the last 33 years. Lisa enjoys playing with the Perse Band and appreciates the level of musicianship the band exhibits as well as the life long friendships formed by performing with this amazing group of musicians. A lifetime Berks County resident, Brian Holt was graduated from Wilson High School in 1957. While at Wilson he participated in County, District, and State band festivals. A fond memory is a school band trip to a Cities Service Band of America radio broadcast in New York City. At an early age, Brian attended many summer band concerts with his parents and grandfather. He still remembers Grandfather Charlie banging out Sousa marches on an upright piano with the sustain pedal on full throttle. Sisters Wendy, Linda, and Emily are also active musicians. At the age of twelve, he began drum lessons with George Haller. Sometime in 1957, Buster Haller, bass drummer with the Ringgold Band of Reading, came to one of Brian’s lessons looking for a drummer. His brother George said, “Give this boy a try!” He played his first full concert season in 1958. In 1961, Brian enlisted in the United States Navy and graduated from the Naval School of Music. He then performed with several Navy unit bands. Navy career highlights included a Mediterranean concert cruise on the Saratoga and playing for a reception in honor of President John F. Kennedy in Costa Rica. Since 1987, Brian has been performing with Keith Brion and his “New Sousa Band,” a group consisting of 45 professional musicians from the United States and Canada. In addition to annual national tours, the band toured Japan in 1996. 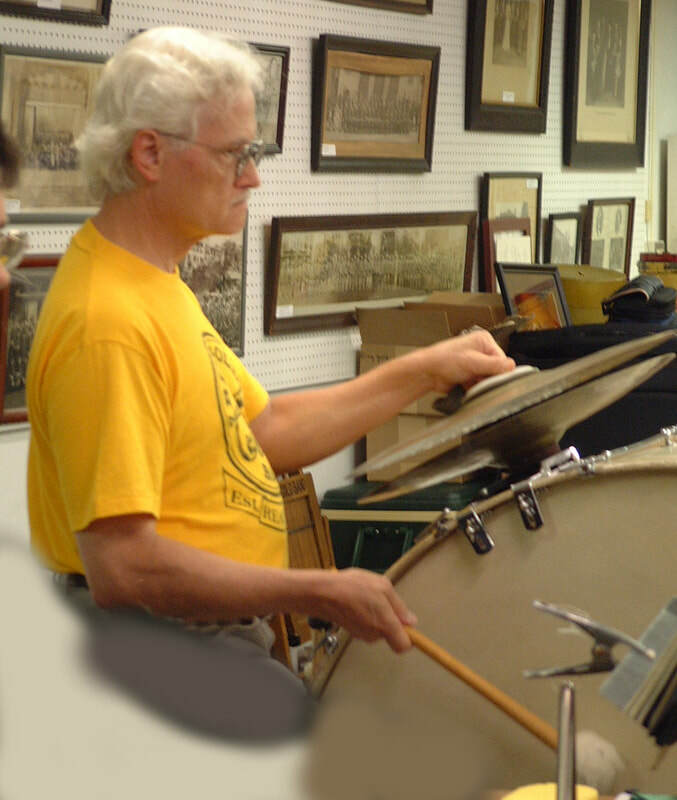 In addition to the Perseverance Band, Brian has performed with the Reading Symphony Orchestra (32 Years), the Allentown band (20 years), Ringgold band, the Reading Pops orchestra, the Lancaster British Brass band, Keystone Band of Rehrersburg, the Berks Grand Opera Orchestra, and the Rajah Shrine band. Brian lives in Reading with his wife, Fianna. They have one son, Christopher, two grandsons, and a beagle. Brian is always happy to converse with anyone on the subject of music or baseball.